This headless, antennae waving slippery slime bag. There I was channelling my inner kitchen goddess, dinner pretty much sorted. The Monkeys behaving themselves, and ready to eat. A lovely enticing dinner aroma tickling the nostrils of those that happened to be passing by my back kitchen door. All that was needed was a chopped up bunch of spinach, wilt it through the dish a little and voila… dinner was ready. I washed the bunch with intimate attention. 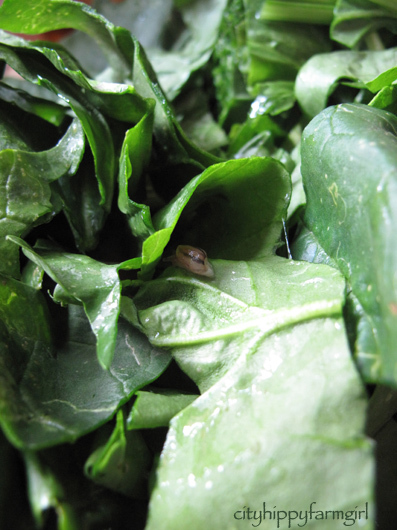 I know where I bought that bunch of spinach from, and I know critters sometimes like to play hide and seek within amongst the green foliage. I was no fool, and hadn’t suspected there was still a hide and seek player amongst us. Happily washed, and chopped, I reached in to dump it all in the slowly bubbling aromatic pot of goodness only to find… him. Dinner plans were slightly reorganised. Hopes were pinned on the now eight times washed spinach. Hopes that the little slime bag didn’t have any close friends still playing the now, not very funny game. I decided there was no need to share the good news with anyone else at this stage and instead keep it as an entertaining dessert time conversation treat. This entry was posted in Food Glorious Food, Rambles, Waffles and Digressions and tagged eating organically, food, fruit and vegetables, local produce, organic, slugs by cityhippyfarmgirl. Bookmark the permalink. My body ripples in revulsion when ever I come across one…but like you I’m sort of happy they are there, if there are happy it’s all good to eat. But still…ick! You need some chooks. I used to hate finding slugs and worms in the veggies I grew… now I walk out to the chook pen with them and give the gerls some extra protein! I know, I know but it’s slippery slime bag protein… half an eaten slug would be 100x worse though. have you tested this theory yourself? Why yes I have…and I got kids at my homeschool group to do it as well! Ugh, but now I have the urge to lick a slug thanks to Citysister. I’ve had that situation myself and it’s not good. But better than finding a headless slime halfway through your dinner. So much better than finding it half way. I’m not sure I could continue if that had happened. I had some homegrown cabbages I was going to try making sauerkraut (again) but the slug I found just put me off… I knew I wouldn’t able to eat it anyway! Other things I can rinse off & not think about it… but slimey bugs, can you imagine biting into that?! Ergh!! Chickens were happy though… chopped up cabbage & some extra protein too! Oh no! Sauerkraut would have been great dixiebelle. Lucky chooks indeed! and no I couldn’t imagine biting into it…shudder. I do struggle with the bug issue – and not just the ones that might be in my food (although they take priority!). My capsicum plants are routinely attacked by white cabbage moths and whilst I hate to use pesticide, I’m running out of ideas as to how to keep the plants from being eaten. It’s a challenge indeed. It can be really discouraging can’t it when growing. I’ve got such a small tiny place to grow anything and the plants really battle to get grown- then for some slime bag/ critter to come along and demolish it all over night is heartbreaking. Keep going though Kari, you’ll find out what works best for you and your garden and hopefully those critters will stay away. right – that would have had be pondering whether to eat or not! It wasn’t as enjoyable as it was going to be that’s for sure. I haven’t heard of that with the vinegar before, I’ll have to keep that in mind next time I suspect a few hide and seek players. Ohhh, shudder! I have that same worry with fresh lettuce here. I stopped buying it because it freaked me out. I think someone I know submerges theirs for hours. Maybe it drowns them and they float?? uggh! I just try and think, that if they are happy then it will be good for you too. No nasty chemicals lurking instead! I wouldn’t have eaten it. I would have soaked it and soaked it in vinegar and then probably still not eaten it. I love organic- just wish slugs didn’t. They are cheeky little slimebags. I really thought I had done a thorough job of searching and washing. Clearly I need more practise. Toss them in some garlic, parsley and melted butter. Mmmmmm. You’re right. Maybe I’ve just gotten too soft. Achh! *gag* Not a fan of the slugs in greenery. To offer comfort, at least the spinach was going back on the heat…which said half slug would be ….ahhh, cooked a little? Protein and all. 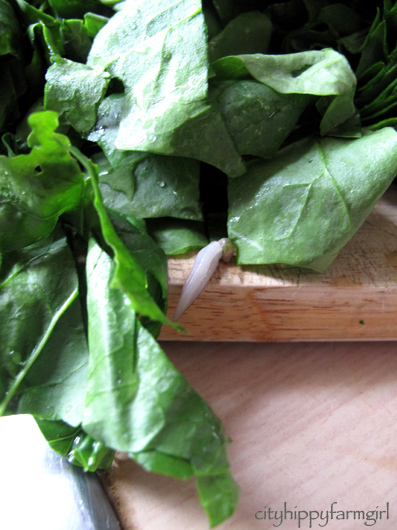 Imagine, raw slug in a fresh garden salad…*gags once again*. Not, definitely NOT going to try the tongue numbness thing..bleurgh! Interesting article. I’ve got lots of thoughts with this one. Yes, in western culture it does seem a bit precious not to eat these sort of critters when it’s perfectly acceptable to eat sea crustations, frog legs etc. A meat is a meat, but then how much goodness really is in a meal worm? I was surprised to read the humble grasshopper is apparently just as nutritious as beef would be. Reminds me of Casu Marzu. Apparently the larvae once disturbed can jump quite a distance, so it’s wise to cover your eyes on eating. I think if I was going to go down that route the critters would definitely have to be well cooked first. What a funny little post. To use the words of my husband; ‘a little extra protein won’t hurt anyone’. ROFL!! What a funny post and comments. I’ve eaten cooked witchetty grubs but they aren’t slimey. You can also treat a slug the same way as a leech and salt it directly or rinse in salty water and it will remove itself pretty quickly from your garden produce.